Awesomium windowless web framework and engine has been ported to Linux. Awesomium can be used for web page capture, site scrapping, in-app advertising, in-app browsing, web automation, rendering custom in-game web browser and creating HTML UIs for 3D games. Awesomium is a software library that makes it easy to put the web in applications. Whether that means embedded web browsing, rendering pages as images, streaming pages over the net, or manipulating web content live for some other purpose. Ability to render web-pages to any graphics surface, 3D texture, or otherwise. Perfect for use in games, multi-touch simulations, and more. Uses a multi-process architecture for crash isolation, security sandboxing, and premium load-balancing across multiple CPU cores. Flexible resource Interceptor system makes it easy to monitor HTTP requests and/or use your own custom resource-loader. 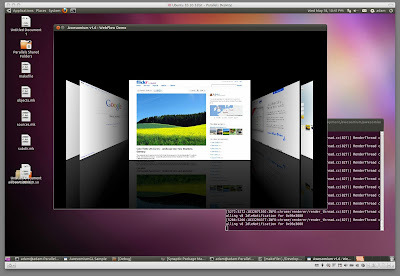 The Linux porting work is done by Adam Simmons from Awesomium development team. Users have requested for Linux port for quite some time and the developers have been quick in responding. One week back Adam Simmons reported that Linux port has come a long way and a new experimental build will be posted soon enough. I've finished porting Awesomium to Linux-- still a couple smaller glitches to work out but the majority is complete.Thank you all for your patience and your well-written rationales concerning Linux support in Awesomium; we hear you loud and clear. I'll be posting an experimental build for you guys to test out next week. UPDATE: Experimental build for Linux SDk is already available, thanks to Adam Simmons. You can download the SDK from here (32bit pre-compiled binary). It also includes a pre-compiled copy of the WebFlow sample.